1903—2000 On September 17, 1903, George (Georges) "Kolty" Gustaf Koltanowski was born into a Polish Jewish family. He was born at No. 2 Loos Street, Antwerp, Belgium. His father was a diamond cutter and diamond broker for Diamond Bourse, the largest diamond exchange in the world. George was the youngest of six brothers and one sister. Kolty's first love was stamp collection. Over the years, he collected thousands of stamps. In August 1914, the Germans invaded Belgium. Koltanowski's whole family left Antwerp and walked 12 hours north (about 30 miles) to the Netherlands with all of their belongings in a cart. They then went by boat to London where they had relatives. Koltanowski learned English during his time in London. In 1915, Kolty got a splinter in his leg, which led to blood poisoning. Doctors discussed amputating both of his legs. He was confined to bed for two years and had 14 operations, but it saved his legs. It was this period that Koltanowski developed his memory. He later applied it to blindfold chess. In 1918, he joined the Antwerp Chess Club (Cercle des Echecs d'Anvers). He was introduced to the chess club by a Catholic nun named Sister Margaretha. Players at the Antwerp Chess Club included Emanuel Sapira (1900-1943), Arthur Dunkelblum (1906-1979), Isidor Censer (1898-1973) , Perlmutter, and Izzy Schernetzky. In 1919, his father took George down to the diamond merchants place in Antwerp to play chess. By now, George was able to beat everyone he played chess with in Antwerp. In 1920, at age 17, he joined the Jewish sporting club, Le Cercle Maccabi in Antwerp. In 1921, Koltanowski became champion of Antwerp. On March 13, 1921, Kolty played his first game of blindfold chess in Ghent, against M. Branco Tchachbritch (Charevitch). It was drawn in 33 moves. On April 13, 1921, Kolty gave his first simultaneous blindfold exhibition in Ghent, playing two of his brothers (Jack and Harry), and winning both games. A week later, he was playing 3 opponents blindfold at one of the Antwerp chess clubs. Unfortunately, he lost all 3 games and swore he would never play another blindfold game again. In May, 1921, the Antwerp Chess Club (Le Cercle des Echecs d'Anvers) organized a blindfold tournament. Koltanowski tried to play three games (against Sapira, Dunkelblum, and Autfenne), but lost all his games and could not play a blindfold game. The rest of the chess club members teased him about this. So Koltanowski decided to do something about it. He went home and cut a board in four sections. He studied the four smaller boards, and then knew the whole board. After two weeks of studying how to play blindfold chess, he returned to the chess club and beat 6 players blindfolded in three hours. Months later, after some practice, he was able to play 6 opponents at once blindfolded. In 1921, he played Fr�d�ric Lazard (1883-1948), a strong French player, in a match in Antwerp. Koltanowski won the match with 3 wins, 1 loss, and 1 draw. In November 1921, he played in the first Belgian Chess Championship, held in Brussels. It was won by Dr. Nicholas Borochovitz. Edgar Colle (1897-1932) took 2nd, followed by Horowitz. Koltanowski took 4th. In 1922, Koltanowski was able to play 16 games blindfolded. In March, 1922, he and Emanuel Sapira played against Alexander Alekhine in a simultaneous display at the Antwerp Chess Club and lost. The next day, Koltanowski played Alekhine in another display given by Alekhine, and Koltanowski drew. In July-August, 1922, Kolty in the 15th British Chess Federation Congress Major Open (not the Master Tourney) in London, but took 11th out of 12 places. He won 3, lost 7, and drew 1. In September, 1922, Kolty took 2nd place, behind Edgar Colle, in the 2nd Belgian championship, held in Antwerp. Colle and Sapira tied for 2nd-3rd. In 1923, he played 16 simultaneous blindfold games, establishing a new Belgian record. In 1923, he was the champion of his chess club, the Cercle Maccabi, in Antwerp. His club won the club championship of Belgium in 1923, with Koltanowski playing Board 1. His club won the club championship of Belgium in 1923, 1925, 1926, and 1927. In May 1923, George Koltanowski won the 3rd Belgian championship, held in Ghent. He scored 5 out of 6. In late 1923, Koltanowski was conscripted in the Belgian army. His platoon was part of the Belgium Hospital Service. He served time in Namur, The Netherlands. His military captain, who was also the president of the local chess club, encouraged him to take time off for chess. He got a furlough to play in the international tournament in Merano, Italy. In February 1924, Koltanowski, Belgian champion, visited and played in his first international tournament in Meran (Merano), Italy. He was planning to play in one of the reserve sections. However, the organizers asked him to play in the master section, to replace an invited player who had not shown up. Kolty took 11th place with 3 wins, 6 losses, and 4 draws. His only major win was against Edgar Colle and he drew with Siegbert Tarrasch. He lost to the top 4 players. Ernest Gruenfeld took 1st place, followed by Spielmann and Rubinstein. On June 7, 1924, he played Board 1 in a match Belgium vs. The Netherlands. He lost on Board 1 against Max Euwe. The event was held in Brussels. The Netherlands won the event. In July 1924, he played Board 2 for Belgium in the unofficial Paris Chess Olympiad (called the Team Chess Tournament), which coincided with the 8th Summer Olympic Games in Paris. He tied for 4th-7th for best individual score. He won 3 games, drew 3 games, and lost 2 games in the Consolation Cup. Belgium took 9th place. Kolty was also involved in the original formation of FIDE, the World Chess Federation. In 1924, Kolty played 20 opponents blindfolded simultaneously at Namur, Belgium, while still in the Army. In 1924, Kolty's platoon was transferred near Duisberg, Germany as part of the Belgian Hospital Service. Koltanowski did not play in the 1924 Belgium championship, held in September in Brussels, because he was away in the Belgium army. Edgar Colle won it that year. In 1925, he played a match against EdgarColle in Antwerp, but lost the match (4 losses, 3 draws). On October 11, 1925, he played Board 2 in a match Belgium vs. The Netherlands, held in The Hague. He won his game against Adolf Olland (1867-1933). The match was drawn with the score of 5-5. In November, 1925, he played a match with Edgar Colle. He lost the match with 0 wins, 4 losses, and 3 draws. In September, 1926, he played in a master tournament in Spa, Belgium. He took 9th place. The event was won by Friedrich Saemisch (1896-1975). In November, 1926, he played Board 1 in a match Belgium vs. The Netherlands, held in Brussels. He lost to Max Euwe. The Netherlands won the match by the score of 7-3. In 1926-1927, he won the Major Tourney section (not the Premier Tourney) at the 7th Hastings Christmas Congress. The Premier Section was won by Savielly Tartakower. In July 1927, he played Board 1 for Belgium in the first official Chess Olympiad (called the Tournament of Nations), held in London. He scored 56.7% with 4 wins, 9 draws, and 2 losses. Belgium tied for 14th-15th place. In September 1927, he won the 7th Belgian chess championship, held in Ghent. In 1927, he won a master tournament in Antwerp. In 1927-1928, he tied for 1st in the Major Open � Section A at the 8th Hastings Christmas tourney. In July 1928, he tied for first in the Major Open section of the 21st British Chess Federation championship, held in Tenby. In July-August 1928, he played Board 2 for Belgium in the 2nd Chess Olympiad, held at The Hague. He scored 59.4% with 7 wins, 5 draws, and 4 losses. In 1928-1929, he took 4th place in the Premier section of the 9th Hastings Christmas Congress. In 1929, he played a 10-board blindfolded exhibition in Antwerp. In February 1929, he took 2nd place in the 7th Belgian championship, held in Ghent. The event was won by Edgar Colle. In June, 1929, he took 8th-9th place in an international tournament in Paris, won by Dr. Savielly Tartakower. Marcel Duchamp defeated George Koltanowski in 15 moves in the Tourneoi d'Echecs in Paris. In July-August, 1929, he played at Ramsgate. He took 4th-5th place. Jose Capablanca won the event. Up until the worldwide economic depression in the late 1920s and early 1930s, Kolty divided his time between chess events and the family business of diamond-cutting. He soon gave up his career as a diamond cutter to play chess full time. He did not participate in the 8th Belgium Championship, held in December, 1929. That event was won by Edgar Colle. In 1929-1930, he tied for 1st in the Premier Reserves section of the 10th Hastings Christmas tourney. In January, 1930, he took 5th-6th at Antwerp. Salo Flohr won the event. In March, 1930, he won a masters tournament, held in Brussels. In September, 1930, he won the 10th Belgian chess championship, held in Verviers. In 1930-1931, he tied for 3rd-4th in the Premier Reserves section of the 11th Hastings Christmas tourney. On May 10, 1931, he played 30 boards blindfolded simultaneously in Antwerp. The event was organized by the Flemish Chess Club. He won 20 and drew 10. The exhibition was against a group of players drawn from the chess clubs of Antwerp. The exhibition took 10.5 hours. He broke Richard Reti's record of 29 games blindfolded, played in Sao Paulo in 1925. This record was broken in 1933 when Alekhine played 32 games blindfolded in Chicago. In August 1931, he drew British master William Winter in a match in London, winning 1, drawing 1, and losing 1. He did not participate in the 10th Belgium championship, held in September, 1931. That event was won by Marcel Barzin. In 1931-1932, he took 2nd in the Premier Reserves section of the 12th Hastings Christmas tourney. In 1932, he abandoned his diamond cutting career and a short-lived women's hat business to become a full time chess professional. In February 1932, he took 7th at the London Congress Masters Tournament. Koltanowski was to play in the Premier Reserves tournament, but was promoted to play in the Masters tournament when Edgar Colle was invited, but had to withdraw at a late stage due to illness. The event was won by Alekhine, who also won the most brilliant game of the tournament in his win against Koltanowski. In March, 1932, he won a masters tournament in Antwerp, ahead of Salo Flohr. In 1932, Kolty became the top Belgian chess player when Edgar Colle died on April 20, 1932, at the age of 35. In April, 1932, he tied for 1st in the Major "A" section of Easter Congress in Cambridge, England. In 1932, Kolty played 20 boards simultaneously blindfolded in Hampstead, England, a British blindfold record. In 1932, he played 160 boards simultaneously at Antwerp. He won 136, drew 18, and lost 6. From October 1932 to September 1933, he edited Chess World in Antwerp, Belgium. This was the first English-language magazine published in a non-English-speaking country. By the end of 1932, Koltanowski was one of the top 40 players in the world. In 1932-1933, he took 4th in the Premier Reserves section of the 13th Hastings Christmas Congress. The Premier Section was won by Salo Flohr. In January, 1933, he took 2nd at a tournament in Antwerp, behind Lajor Steiner. In 1933-1934, he tied for 1st in the Premier Reserves section of the 14th Hastings Christmas tourney. In February 1934, he played 6 boards blindfolded in a tandem exhibition with Alexander Alekhine at Antwerp. Each board had 4 of the strongest players from each chess club in Belgium, for a total of 24 players. In 5 hours, they won 3, drew 2, and lost one. It was the first time in the history of chess that two masters played a tandem blindfold exhibition without any kind of consultation. Koltanowski said that the strain of such an exhibition was "an inquisition of the brain." In June, 1934, he tied for 1st with Andor Lilienthal and Savielly Tartakower at an international tournament in Barcelona, Spain. In July 1934, he played 10 opponents blindfolded in Barcelona. 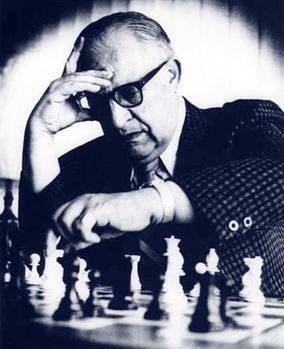 Koltanowski spent a year in Barcelona as a chess teacher and trainer. In 1934-1935, he tied for 1st in the Premier Reserves section of the 15th Hastings Christmas tourney. In 1935, Kolty became a chess coach and trainer at the Madrid Athletic Club in Spain. He left after the outbreak of the Spanish Civil War. In February 1935, he played an 8-board simul at Breda, Netherlands. In June 1935, he tied for 1st with Salo Flohr at Barcelona. In June 1935, he took 2nd at Rosas, a small fishing village near the French border. The event was won by Salo Flohr. In July 1935, he tied for 1st with Kahn at Mollet, Catalonia, Spain. In 1935-36, he took 4th place at the 16th Christmas Congress in Hastings, behind Fine, Flohr, and Tartakower. Koltanowski won 3, drew 5, and lost 1 (to Flohr). The event was held at the St. Leonard's Chess Club. In April 1936, he tied for 1st (with Adrian Conde of Mexico) in the Premier Reserves A section at the second annual international Congress at Margate, England. The Premiere section was won by Flohr, ahead of Capablanca. In July 1936, Kolty left Spain after the outbreak of the Spanish Civil War on July 17, 1936. He escaped from Madrid via the last train to Valencia, and from there, he took an English warship to Marseilles. In 1936, he played an 8-board blindfold simul in Antwerp. Each board had two consulting players. In 1936, he won the Belgian chess championship, held in Ghent. He had won it in 1923, 1927, and 1930. This was his last Belgian Championship. In 1936-37, he played in the Premier Tournament of the 17th Annual Hastings Christmas Congress. Arthur Reynolds, who was one of the English competitors, withdrew and his place was taken by Koltanowski, who was promoted from the Premier Reserves event. Alexander Alekhine won the event, followed by Fine. Koltanowski took 8th out of 10, and drew with Alekhine. Koltanowski won 1, lost 4, and drew 4. The event was held at the St. Leonards Chess Club. In January, 1937, he took 4th at Birmingham, England. Erich Eliskasas and Lodewijk Prins took 1st-2nd, followed by William Winter. From January to March, 1937, Kolty toured England, Scotland, Ireland, and Wales. In two months he played nearly 500 chess games, both blindfold (237 games) and sighted displays in over 50 different exhibitions. He set a new British blindfold record by playing 21 simultaneous blindfold games in the historic Roman Pump Room at Bath, winning 14 and drawing 7. (source: Winnipeg Tribune, April 24, 1937). In April, 1937, he took 7th at the Ostend Masters Tournament (4.5-4.5). That event was won by Paul Keres, Fine, and Grob. He defeated Grob and drew against Keres. The tournament was held at the Kursaal Casino. This was the first tournament that two scoresheets with carbon paper between the two were used. In 1937 he tied in a match with Henri Grob in Zurich. He won 1, lost 1, and drew 2. In May, 1937, he went to Dublin, Ireland to train for the 34-board simultaneous exhibition to be played in Edinburgh. On September 20, 1937, Koltanowski set the world's blindfold record in Edinburgh, Scotland, by playing 34 chess games simultaneously while blindfolded (breaking Alekhine's record of 32 simultaneous blindfold games). He won 24 and drew 10 games in thirteen and a half hours. When the exhibition was over, he would recite the complete moves of the games without looking at the board. The exhibition was organized by the Stockbridge Chess Club in Edinburgh. One of the players was the champion of Scotland. Ten other countries were represented. Koltanowski was paid 1,000 British pounds for his effort (equivalent to $20,000 in today's currency). In October-November, 1937, Kolty toured Switzerland. He gave 26 exhibitions (10-board blindfold exhibitions) in 26 days in 26 different towns and cities. He scored 94% in 260 games. In 1937-38, he played in the Hastings Premier Reserves section. The Premier section was won by Reshevsky. In 1938, Kolty left Belgium to tour the world and play chess. In April 1938, he played a 12-board blindfolded simul at Bussum, Netherlands. In April 1938, he played in the Margate Premier Reserves B section and was the only one undefeated. In July, 1938, he gave a 10-board blindfolded simul in Dunkirk. In September 1938, Koltanowski left Europe for America. From September through October, 1928, he gave blindfold exhibitions in Quebec, Toronto, Winnipeg, Milwaukee, Chicago, Peoria, Detroit, Buffalo, and New York. In December, 1938, he gave an exhibition at the Faculty Club of Columbia University. In February 1939, Kolty gave a 12-board blindfold simul at the Boston City Chess Club. Each board had two players that could consult with each other. He won 5, drew 6, and lost 1 (to R. Chauvenet and R. Dawson). On March 1, 1939, Kolty gave his first blindfold exhibition in Havana, Cuba. He played 8 boards blindfolded and won all his games. On March 23, 1939, he gave a 5-board blindfold exhibition in Guatemala City. In April, 1939, he gave a 30-board exhibition in San Salvador. In June, 1939, he gave 9 exhibitions in Mexico City. In the summer of 1939, he was in Milwaukee involved in youth chess. He was supposed to have played for Belgium in the 1939 Chess Olympiad in Buenos Aires, but the Belgium team did not participate. In early November, 1939, Koltanowski drew two games against Charles Bagby in a match played in San Francisco. In late November 1939, the Hollywood Chess Group sponsored the California State Championship. The event was won by Philip Woliston, age 19. 2nd-3rd place went to Herman Steiner and Harry Borochow (1898-1993). George Koltanowski took 4th place. Koltanowski scored 4.5-3.5. There were 9 players. In 1940, Kolty was giving simultaneous exhibitions in Guatemala. Koltanowski appeared in the Jan 15, 1940 issue of LIFE magazine playing 10 simultaneous blindfold games in Wellesley, Massachusetts. In late January, 1940, he took 2nd at a Havana tournament. The event was won by Isaac Kashdan. Koltanowski scored 6.5-2.5. In February, 1940, he took 1st at Santiago de Cuba, Cuba. In March 1940, the United States Consul in Cuba saw Koltanowski giving a chess exhibition in Havana and decided to grant him a U.S. visa. In April, 1940, he gave a blindfold exhibition in Boston. On May 10, 1940, Germany invaded neutral Belgium. Most of Koltanwoski's family was lost in the war. In the summer of 1940, Kolty was a chess instructor at the Milwaukee public playgrounds in Wisconsin. Kids who drew or beat him won a bicycle. In September, 1940, he gave exhibitions in Pennsylvania, Boston, Massachusetts, Portland, Maine, and Wilmington, Delaware. In October, 1940, he played 10 opponents blindfolded in Detroit. In December, 1940, he gave a blindfold exhibition in Ventor City, New Jersey. By the end of 1940, he signed up 886 new members to the US Chess Federation (USCF). He was voted life member to the USCF. In February, 1941, he gave a blindfold exhibition in Dallas. In August, 1941, he took 2nd at the Great Lakes Tournament in Milwaukee, behind Erich Marchland. In October, 1941, he gave a blindfold exhibition at the Washington Chess Divan in Washington, D.C. In November, 1941, he gave a blindfold exhibition in Sacramento. In December, 1941, he gave an 8-board blindfold exhibition in New Orleans. In March, 1942, he gave a simultaneous exhibition in Dallas. He explained the "Swiss System" to J.C. Thompson, President of the Texas Chess Association. The Swiss System was then used by Thompson in the 1942 Southwest Open, played in Corpus Christi in September, 1942. That event was a 7-round Swiss event, won by Bela Rozsa. There were 27 players. In April, 1942, he gave an 8-board blindfold exhibition in Austin, Texas. In 1942, George Koltanowski shared an office space with Marcel Duchamp. In June 1942, Marcel Duchamp and George Koltanowski formed the Greenwich Village Chess Club. In October, 1942, he gave a 6-board blindfold exhibition in Cleveland. He won all his games. In November, 1942, he gave an 8-board blindfold exhibition in Denver. In January 1943, he was employed as a diamond cutter in Manhattan on West 36th Street in the garment district. In January, 1943, he gave a blindfold exhibition in Jamestown, New York. On January 30, 1943, he gave an 8-board blindfold exhibition in Bronxville, New York, winning 6, losing 1 (to Alfred Pierce), and drawing 1 (to Rosser Reeves). He also performed his Knight's Tour. In February, 1943, he gave blindfold exhibitions at the Bronx Physicians Chess Club and at the New World Chess Club in New York. In March, 1943, he gave a 6-board blindfold exhibition at the Manhattan Chess Club. He won 4 and drew 2. In 1943, he played 35 boards simultaneously in Portland, Oregon. The organizer thought he was going to play all 35 boards blindfolded. Koltanowski convinced him otherwise. In September, 1943, he introduced the Swiss System in Pittsburgh at the 5th Annual Pennsylvania State Chess Federation Championship. The 6-round event was won by Tom Gutekunst. There were 31 players. Koltanowski played most of the participants in a simultaneous exhibition at the start of the tournament. In October, 1943, Miguel Najdorf broke Koltanowski's blindfold record by playing 40 games blindfolded in Rosario, Argentina. He won 36, lost 3, and drew 1. Each board had 2 players, so he played 80 opponents. It took over 17 hours to complete. In 1943, Kolty was barred from playing postal chess or give chess lessons to students overseas or in South America. Wartime mail regulations prevented mailing abroad any abbreviations, nicknames, and codes. On March 10, 1944, George Koltanowski and Marcel Duchamp sat down in New York for a game of chess. Koltanowski won as Black, and Duchamp presented Kolty a smoking pipe. In 1944, Kolty met his second wife, Leah Greenberg of Springfield, Massachusetts, in New York on a blind date. She never learned how to play chess. She once said, "George is the grandmaster. If he taught me the game, I'd be just another chess player." In August, 1944, he was to give a blindfold exhibition at the IBM Country Club in Eudicott, New York during the New York State Chess Championship. The event was called off because the U.S. government told IBM to cancel all conventions to reduce the burden on traveling facilities. From December 12, 1944 to January 31, 1945, Marcel Duchamp organized an "Imagery of Chess" exhibition at the Marshall Chess Club and the Julien Levy Gallery (4th floor at 42 East 57th Street). He invited artists to redesign the standard chess sets or create works that explored the symbolism of chess. Duchamp designed the catalog and was the arbiter in a blindfold match given by George Koltanowski on 7 boards, played on January 6, 1945. The seven players were: Julien Levy, Frederick Kiesler, Alfred Barr, Vittorio Rieti, Xanti Schawinsky, Dorothea Tanning, and Max Ernst. Marcel Duchamp was his teller who called out the moves. Kolty won 6 and drew one (to Kiesler). (source: "Phonographic Mind," in "Talk of the Town," The New Yorker, Jan 6, 1945, p. 15-18). Chess Pie No. 3 came out in 1936 as the official souvenir of the Nottingham 1936 International Tournament. It was also edited by Watts. All of the publications were issued to promote and publicize each event beforehand. In January, 1945, he played 8 opponents blindfolded at the Washington Chess Divan in Washington, D.C.
During World War II, many of Kolty's relatives, including his mother and brother, Harry, died in the Holocaust. In October, 1945, he gave a blindfold exhibition in Akron, Ohio. In December, 1945, he gave a blindfold exhibition in Hollywood, California. In February, 1946, he gave an 8-board blindfold exhibition in Chicago. In March, 1946, he had completed over 90 blindfold exhibitions in three months around the country. In April, 1946, he gave 4 blindfold exhibitions at 8 games each in Puerto Rico. In June, 1946, he won a small tournament in Cuba. In July, 1946, he played in the 47th U.S. Open in Pittsburgh, but was eliminated in the preliminary section and did not qualify for the finals. He then withdrew from the tournament. It was his first and last rated chess tournament in the USA. The Open was won by Herman Steiner. There were 58 players. In 1946, George Koltanowski married Leah Greenberg. It was his second marriage. The best man was Milton Finkelstein. Koltanowski then moved to South Dakota. In September, 1946, he was directing the South Dakota State Championship. In 1946, Koltanowski edited the monthly South Dakota State Chess Bulletin. In October, 1946, he played 8 opponents blindfolded in Vancouver, British Columbia. He won 3, drew 3, and lost 2 in 5 hours. In November, 1946, he gave a blindfold exhibition in Lancaster, Pennsylvania. In December, 1946, he gave exhibitions in Columbia, South America. In January, 1947, he gave a blindfold exhibition in Buffalo, New York. On February 24, 1947, Kolty gave a blindfold chess exhibition at the Native Sons Hall in Santa Rosa, California. In March, 1947, he gave an 8-board blindfold exhibition in Milwaukee. In April, 1947, he was master of ceremonies at the British Columbia vs. Washington State annual match (won by Washington). In 1947, he moved from New York to Santa Rosa, California. In June, 1947, he gave an 8-board blindfold exhibition at Oak Ridge, Tennessee. In July, 1947, he was director of the Milwaukee summer playground chess program. In August 1947, he directed the U.S. Open in Corpus Christi, Texas (won by Isaac Kashdan), using the Swiss System for pairings (the Swiss System was first used for the preliminary round of the 1946 US Open because of the large number of entries). He was greatly responsible for popularizing the Swiss System for tournaments in the US. There were 87 players. Isaac Kashdan won and received $1,000 as first prize. In November 1947, Kolty edited the California Chess News (later to become Chess Digest) and News of the Pacific Coast. In 1948, Kolty had a chess column in the Santa Rosa (California) Press Democrat newspaper. In May, 1948, he played Board 1 for the North in the North-South California match, held in Atascadero. He drew his game as white with Herman Steiner. On May 9, 1948, (some sources say May, 1947) Koltanowski became the chess columnist for the San Francisco Chronicle. Initially, it was a weekly chess column. He later wrote his chess column every day for the next 52 years without interruption until his death in 2000, publishing an estimated 19,000 columns. His chess column soon appeared as a syndicated feature in other papers. In September, 1948, he directed the California State Championship, held in Atascadero. James Cross, age 18, won the event. It was the first California Swiss system event. There were 36 players. In October, 1948, he played 8 simultaneous blindfold games at the Orange Chess Club. In 1949, he was writing a chess column, called Chess Chats, for the Sunday edition of The Press Democrat in Santa Rosa. In 1949, he helped in the formation of the California State Chess Federation. In May, 1949, he played Board 1 for the North in the North-South California match, held in Atascadero. He drew his game as black with Herman Steiner. In August, 1949, he played 55 games, winning 48 and drawing 7 in an exhibition in Sonoma. In October, 1949, he played 24 boards in Los Angeles, winning 21 and drawing 3 (to Nancy Roos, Morris Gordon, and George Croy). On December 4, 1949, he played 271 games simultaneously in 12 hours at the Marines Memorial Club in San Francisco. He won 251, drew 17, and lost 3. He faced 37 players at a time. The event was sponsored by the San Francisco Chronicle (the Chronicle Chess Festival). There were over 2,000 spectators. In 1950, he was awarded the International Master (IM) title, when the title was first officially established by FIDE. In 1951, Kolty conducted a chess column in Fortnight, a bi-weekly news magazine in California. In 1951, he played 50 games of 10-seconds-a-move blindfold chess, winning 43, drawing 5, and losing 2 in 9 hours of play in San Francisco. On Dec 2, 1951, Kolty played 50 boards blindfold (one at a time, 10 seconds a move) in Stockton, California. He won 43, drew 5, and lost 2. The exhibition took 8 hours and 45 minutes. In March, 1952 Bogart was in San Francisco for the premier of The African Queen, and played a game with George Koltanowski. Koltanowski played blindfolded and defeated Bogart in 41 moves. In 1952, he played two games as Board 1 reserve for the USA team at the 10th Chess Olympiad, held in Helsinki. He drew with Soviet Grandmaster Alexander Kotov, one of the strongest players in the world, and a draw with Hungarian International Master Tibor Florian. In 1952, Koltanowski hosted a chess program on radio station KPFA of Berkeley, California, commencing each Friday night at 9 pm. He played a game against the station's listeners, and then analyzed the game in future broadcasts. In January, 1953, he played 12 opponents blindfolded in an exhibition in Vancouver, British Columbia. He won 9 and drew three. He was able to recall every move made after the exhibition, which took 5.5 hours. In March, 1953, he gave an 8-board blindfold exhibition in Brussels. In 1953, he played his last match and tournament game with Henri Grob in Zurich, Switzerland. Kolty won 2 and drew 3 games. In February, 1955, he played 12 opponents blindfolded in Vancouver, British Columbia. Koltanowski was 51 at the time. On May 22, 1955, he played 110 games simultaneously in Los Angeles. He won 89, drew 17, and lost 4. It took over 12 hours. In 1955, he wrote Adventures of a Chess Master, published by David McKay Co. In 1956, he gave a simultaneous exhibition in New Orleans. One of the participants was Jude Acers. In 1956, he directed the US Open in Oklahoma. Bobby Fischer, the 13-year-old whiz, after playing his fourth master opponent in a row asked me: "When do I get a fish as an opponent?" So Koltanowski promptly gave him Fischeimer of Chicago. In April, 1957, he gave simultaneous exhibitions in Toronto. He played 58 players, winning 55, losing 1, and drawing 2. In 1957, he brought the U.S. Junior Championship to San Francisco. The tournament was won by Bobby Fischer. Koltanowski directed the event. In 1958 and 1959, he gave a simultaneous exhibition in Denver. In July-August, 1959, he directed the 60th US Open in Omaha, Nebraska. The winner was Arthur Bisguier. In November, 1959, he conducted a 30-board simul in Dayton, Ohio, winning all 30 games. In 1960, he was awarded the International Arbiter title by FIDE. In 1960, he moved to 1200 Gough Street, Apartment D-3 in San Francisco. On December 4, 1960, at the Fairmont Hotel in San Francisco, California, Koltanowski played 56 consecutive games blindfolded, with only ten seconds per move. He won fifty and drew six games in 9 hours. The event was sponsored by the San Francisco Chronicle. Koltanowski still holds the record in the Guinness Book of Records. In 1962, he played 110 opponents simultaneously in Los Angeles. In 1966, he played 26 players simultaneously in North Hollywood, California. In October, 1966, he gave blindfold chess exhibitions in Hawaii. In 1967, Koltanowski was the host of "Koltanowski on Chess," a series of 20 half-hour television broadcasts about chess produced by KQED in San Francisco that aired on public television across the country, the first such program of its kind. In 1968, he was co-captain, along with Ed Edmondson, of the USA team at the 18th Chess Olympiad in Lugano. In 1969, he directed the US Open, held in Lincoln, Nebraska. In 1969, he directed the Nevada State Open in Sparks, Nevada. Before the event started, he played a chess game with Tina the elephant. In 1970, he was co-captain, along with Ed Edmondson, of the USA team at the Siegen Chess Olympiad. In 1972, he played 100 boards simultaneously, winning 97 and drawing 3. In 1972, he traveled to the Chess Olympiad in Skopje, Yugoslavia. In 1972, he was elected vice president of the USCF. He served for 9 years on the USCF policy board. In November-December, 1972, he organized and directed the Church's Fried Chicken International tournament in San Antonio. In 1974, he directed the Canadian Open in Montreal. It was the first time he made use of a computer for pairings. In 1974, FIDE awarded George Koltanowski its Gold Medal to commemorate his work in having helped to found FIDE and to pay tribute to his continuing service to chess worldwide. In 1974, he was elected President of the United States Chess Federation (USCF) and served until 1978. He played blindfold chess on a giant, life-size chessboard. In 1976, he gave a blindfold simultaneous exhibition at Moro Bay, California. In February, 1979, Kolty set a world record for playing and beating four opponents simultaneously blindfold at the age of 75. In 1979, the first USCF Koltanowski Award went to Bill Church, Jacqueline Piatigorsky, and Louis Statham. In 1979, George Koltanowski received the USCF Distinguished Service Award. In October, 1980, he visited Dayton, Ohio. He lectured on chess and gave one of his famous knight tours. I participated in this as president of the Ohio Chess Association, and put the last 4 numbers of my social security number on the square d4. A few weeks later, I wrote him a letter to thank him for his exhibition at the Dayton Chess Club. I included a P.S. - What was on d4? He called me at 7 am (4 am his time) and was able to recall my social security number on d4. Koltanowski donated a Boris Chess Computer to the Dayton Chess Club as a gift. 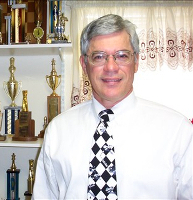 In 1981, he created the first Cal Chess Scholastic Championship. In 1982, he was made an Honorary Member of FIDE. On May 3, 1983, he gave a 53-board simul for kids at the Oxford Primary School at Berkeley. In 1983, at the age of 80, he did a 3-board, 192 square knight's tour. In 1983, George Koltanowski, living in San Francisco, called my house at 7 am (4 am Pacific Time). My wife, Lois, answered and the voice on the other side said, "This is George Koltanowski calling for Bill Wall." My wife, not believing it was Kolty and that it was a prank reponded, "If you are George Koltanowski, I am Raquel Welch." When I heard that, I said, "Raquel, give me the phone." It was George and he was calling about a chess article I had written for the Dayton Chess Club Review and the Ohio Chess Bulletin, and wanted permission to use it in one of his articles. In 1986, he was inducted into the U.S. Chess Federation Hall of Fame as one of the first inductees. In 1988, he was awarded the honorary Grandmaster title by FIDE. In 1989, as president of the Palo Alto Chess Club in Palo Alto, California, I was able to get Kolty to come down from San Francisco to the club to do his famous knight's tour and lecture about chess. I visited him many times at his apartment in San Francisco. On Feb 5, 2000, Kolty died of congestive heart failure at a hospital in San Francisco. He was 96. When he died, The New York Times reported that "Mr. Koltanowski is survived by his wife, Leah, who never learned to play chess and often joked that her husband could not remember to bring bread home from the grocery." That story was relayed to me when I visited his apartment in San Francisco in 1989 and interviewed him and his wife. On December 23, 2005, Leah Koltanowski died, 10 days after her 99th birthday. Koltanowski spoke eight languages (French, Flemish, English, German, Dutch, Spanish, Russian, and Italian). He played chess, gave exhibitions, and did the Knight's Tour in prisons, in schools, on playgrounds, by mail, on ocean liners, by telegram, over the phone and against princes and potentates. Koltanowski wrote at least 18 books on chess.